In an interview for FishDuck.com on Wednesday, I spoke with Oregon quarterback Jeff Lockie at the Hatfield-Dowlin Complex in Eugene. The Oregon Ducks’ Spring practices into there second week, and while the players are happy to be back on the gridiron, Mark Helfrich and his coaching staff understand that things will look a lot different next year. Marcus Mariota‘s run in Eugene was legendary and it’s safe to say that he’s the greatest football player that the University has ever seen. 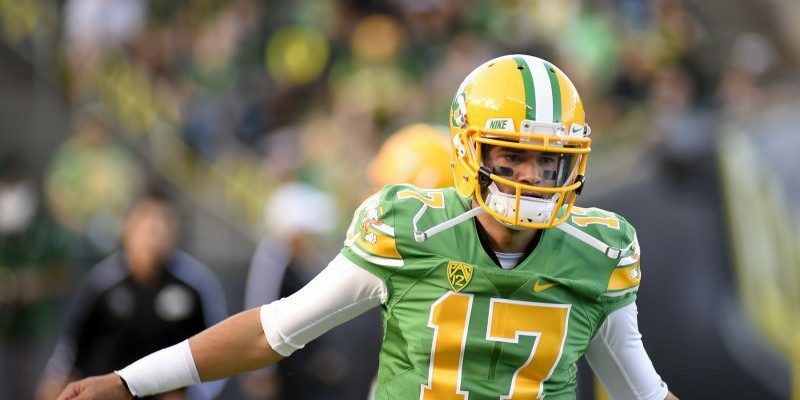 But now there’s one huge question that needs to be answered: Who will be Oregon’s quarterback next season? Of course, there’s no doubt that it will take the Ducks quite sometime to answer that question, but Mariota’s successor might be a lot closer than people think. Jeff Lockie, who will be a redshirt junior next season, is considered to be the leading candidate for the Ducks’ vacant quarterback position. Lockie said he’s ready to seize his opportunity, but he also understands that patience is key. Oregon currently possesses five quarterbacks on its roster, and the Ducks are expected to receive a sixth member once Vernon Adams, Jr. arrives on the Duck campus after his graduation from Eastern Washington. Despite the fact that the Ducks have a plethora of quarterbacks, Lockie believes that the competition will benefit everyone. The Ducks’ coaching staff has praised Lockie’s work so far this spring, and Oregon’s offensive coordinator, Scott Frost, mentioned that he’s been impressed with Lockie’s ability to run the ball. Lockie understands that more responsibility will be placed upon his shoulders as the Ducks continue to move forward, but he doesn’t want to lose sight of the big picture, as he wants his teammates to succeed as well.